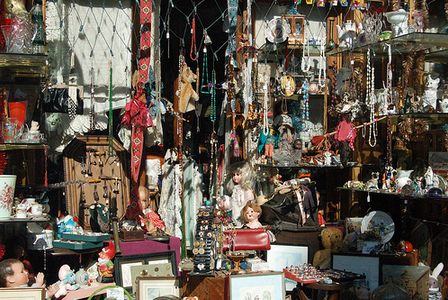 Is it Collectible, Vintage or an Antique? You are here: Home / Articles / Is it Collectible, Vintage or an Antique? Collectibles tend to be items that are highly sought and are valuable because they also tend to be rare or there are limited quantities of them on the market. Not all collectibles however have to be “old” or made many years ago to be “collectible” take for example the Webkinz plush toys that were very recently introduced and they are extremely collectible (the Webkinz Cheeky Dog is on eBay for nearly $1,000) as are the Zhu Zhu Pet Hamsters that were a top 2009 Christmas toy (the rare ones are still selling on eBay for over $300!) 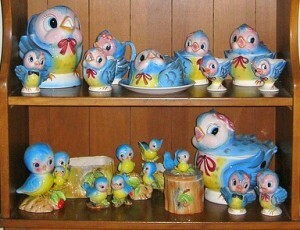 and then you have vintage collectibles like the Holt Howard Pixies and Pixieware from the 1950s to Lefton’s Toodles and the Lefton Bluebirds that were made 50-60 years ago and are commanding prices of $100 upwards of thousands of dollars for the very rare items. Antiques are items deemed by the government, sometime in and around the early 1930s, having an age of at least 100 years. So, if your collectible is 100 years old or older it is actually an Antique. Remember though that it technically must be 100 years old or older to be classified as an Antique…..I see a lot of items on the market described as antique when actually it is not antique but “vintage” and something needs to be at least 20 years old or older to be properly classified as Vintage. Another collectible arena is items that were Made in Occupied Japan or Made in Japan. Items stamped or marked “Made in Japan” were typically made prior to the First World War and after the Second World War as Japan was much like China and Taiwan are today; countries where items can be cheaply manufactured and mass produced. The term “Made in Occupied Japan” refers to the period in history right after the Second World War when the United States, Australia, British India, United Kingdom and New Zealand were involved in re-building Japan and were a main presence. In 1951 a peace treaty was signed that was enforced in the spring of 1952 when Japan became an independent state again. Items produced in Japan during this short time frame are stamped/marked “Made In Occupied Japan” and considered more desirable and valuable by many collectors. I hope this information is helpful and I wish you all much fun in your treasure hunting, junking, flea marketing, antiquing, and thrifting! !